This article presents experience gained from an attempt to develop an ontology for part of Wittgenstein’s Tractatus. The term “ontology” is here used as in computer science (Artificial Intelligence). 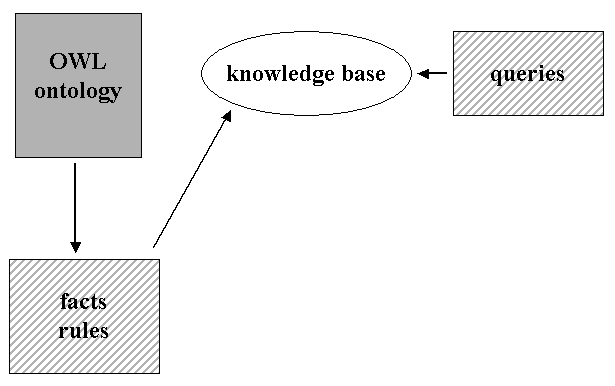 A computer science ontology, similar to a taxonomy, structures information hierarchically and supports semantic retrieval and reasoning. In this article, we outline the mentioned ontology, its development as well as possible applications. Several projects in the field of humanities have already utilized or developed ontologies for different topics. But modelling using ontologies represents just a starting point for more advanced (computational) applications in the humanities. In philosophy, the development and application of ontologies seems still at an early stage. With this article, we wish to help catalyse and develop this process further. This article presents experience gained from an attempt to develop an ontology for Wittgenstein’s Tractatus. The term “ontology” is here used as in computer science (Artificial Intelligence). A computational ontology structures information hierarchically and supports semantic retrieval and reasoning. In this article, we outline the mentioned ontology, its development as well as possible applications. Several projects in the field of humanities have already utilized or developed ontologies for different topics. But modeling topics using ontologies represents just a starting point for more advanced (computational) applications in the humanities. In philosophy, the development and application of ontologies seems still at an early stage. With this article, we wish to help catalyse and develop this process further. Ontologies as they are used in Computer science1 include taxonomies of our conceptualization of a part of the world. This part of the world is called the domain; an ontology structures this domain hierarchically into classes; the classes can have properties (slots) and restrictions, and instances, individual objects, which can be attached to a class. Although the structure of an ontology is rather static, the information included in the ontology can be queried and manipulated in several ways. Ontologies are used today in a wide range of fields, including research, industry and the public sector, primarily to help organize and retrieve semantic information, or more generally, to express structured information. In the last years, such ontology work has also entered the field of humanities and linguistics. Several applications of ontologies have already been developed in linguistics,2 library science3 and literature studies.4 Even though one would expect that formats already developed to express and utilize ontologies are just as useful for storing, retrieving and processing data in the humanities as they are in other areas, using ontologies in the humanities is not yet very common. For our purpose of building an ontology for the Tractatus, we have chosen a popular and widely used ontology language: OWL.6 The fact that OWL works strictly hierarchically and is focused on instances, seemed an advantageous feature, since the Tractatus, at least at first glance, appears to be a work which is hierarchically structured and has a conception of (a part of) reality which can easily be categorized into classes, subclasses and properties. Also, the Tractatus – with its discussion of Gegenstände and Namen - seemed to provide the referents required in any ontology making which is oriented towards instances, much more than most philosophy texts. In the course of applying OWL to the Tractatus we discovered, however, that things were more tricky than it at first seemed. In particular, the ontology’s hierarchical demand and class-subclass (genus-species) focus posed challenges which may show yet unresolved problems for its applicability in the humanities more generally. At the same time, applying such a strict language as OWL to relatively un-strict philosophy texts, or even literary texts, will nevertheless always help to illuminate one’s understanding of these texts and to explicate, communicate and document this understanding. The limitations which we encountered in our small project have therefore not discouraged us from continuing to build and utilize ontologies for philosophy texts, since the advantages remain substantial. In the following, we first present OWL in more detail. An outline of a part of the ontology is then given and possible applications are sketched. Finally, problems and limitations as well as advantages of our ontology approach are discussed. OWL was introduced to enable machine-processing of semantic information on the internet, including logical reasoning: “The OWL Web Ontology Language is designed for use by applications that need to process the content of information instead of just presenting information to humans.”7 There are different versions of OWL, which involve different degrees of rigorousness: In OWL Full, every object of the ontology can take on all ontology categories, i.e. 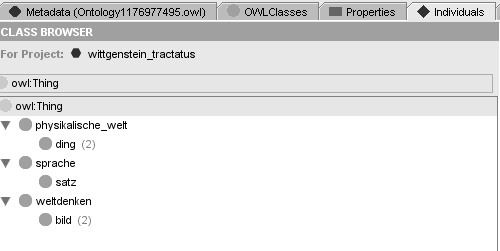 class, instance, etc.8 By contrast, in OWL DL (Description Logic) objects have to be defined uniquely. This prevents certain problems in applications of the ontology. Especially for logic-based applications, OWL DL is most adequate. Users who have already specific applications in mind can create limited and small ontologies with OWL Lite. OWL DL seemed for our purpose the most apt version since the developed ontology should eventually be applicable also to other philosophical texts, while at same time also permitting applications which are as rigorous and controlled as possible. 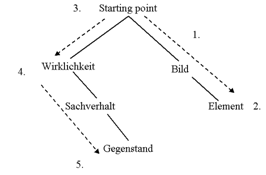 To build our ontology, we identified first central concepts of the text and then modeled their relations in a hierarchy.9 After several revisions, we settled on making Wirklichkeit and Bild superclasses of the ontology, while other concepts, including Sachverhalt and Element, were defined as subclasses. Our going back and forth was caused by the difficulty met identifying which classes would allow the most smooth and consistent inheriting of properties throughout the level of instances. It quickly became clear to us that the hierarchy and inheritance character of the ontology as also its intended genus-species structure met serious obstacles in the text. At the same time, it is through these filters that one very effectively detects that the conceptuality of the Tractatus, at least partly, opposes the hierarchy and inheritance characteristics of, for example, zoological taxonomies. Fig 1 shows a part of the class structure of our Tractatus ontology. Fig 1: Extract of the ontology in the Protégé editor. Every point represents a class; the class hierarchy is represented by indentation. For building ontologies, the identification of instances or example realizations is crucial. But the Tractatus is very sparse in giving concrete examples. Nevertheless, we identified at least a few instances, including roter Fleck im Gesichtsfeld and hoher Ton. Features of the instances were expressed by attributing different properties, e.g. Färbigkeit. To enrich the informational content of the ontology, the properties were also hierarchically ordered as is shown in Fig.2. Fig. 2: Properties externe Eigenschaft, interne Eigenschaft, Färbigkeit, Räumlichkeit, Zeitlichkeit, hierarchically ordered in the Protégé editor. We are aware that the structure of our ontology can be debated and questioned on the basis of a different understanding of the Tractatus. This is, however, not the place to discuss adequate interpretations of the Tractatus and arrangements of its conceptuality as such. It is, however, the place to point out that through such ontology arrangements we not only are better enabled to explicate disagreements in our understanding of the text and to revise our views, but also can have the machine’s assistance for it.10 At the same time, it should not go unnoticed that our ontology endeavor was not straightforward, not without significant uncertainties, and not without unsatisfactory solutions to the problems we met, to which we will return to in the last section of our paper. On the basis of ontologies, especially OWL ontologies, different kinds of applications are possible. Because of its specification, OWL DL inherits concepts of a logic formalism called Description Logic (DL). Thus, it is reasonable to apply mechanisms of logic formalism like reasoning or drawing inferences to an ontology built with OWL DL. In logic-based languages, e.g. Prolog, or in inference machines like Racer, inferences can be drawn and implicit information can be made explicit. These programs use a knowledge base, e.g. an ontology, facts and rules. By querying on the knowledge base, the facts and rules are interpreted so that a result can be found. A scheme of drawing inferences is shown in Fig. 3. All these applications are reasonable approaches toward utilizing ontologies in philosophy. In conclusion, one should check which kind of result is required and should choose the techniques with regard to the demands. In the case of the Tractatus ontology, backtracking proves to be a valuable tool as is exemplified in Fig. 4. Fig. 4: Scheme of backtracking in the Tractatus ontology. Exemplarily, it is queried for Gegenstand: (1.) Traversing search space, (2.) Search condition no longer valid and solution (Gegenstand) not found, (3.) Backtracking to starting point, (4.) New search of remaining part of the tree, (5.) Solution found, stop of search. One aim of our undertaking was to explore the possibilities as well as identify the problems of developing a formal ontology representation for a text of philosophy. We picked Wittgenstein’s Tractatus which seemed as promising a candidate as a philosophy text can be. In the process of creating the ontology, we soon faced problems and limitations. Wittgenstein’s terms cannot always be organized hierarchically, as the OWL specification demands. Sometimes, it was difficult to decide whether a term was completely subsumed by another one, or where a term was used as a synonym, belonging to the same hierarchical level rather than to a sublevel. Hierarchy poses a problem also on another level: Information which lies outside the hierarchical relationships cannot easily be included by using OWL. But, at least with regard to synonymy, we could use cross-links or use an OWL construct which defines objects as synonyms. A second problem was the inheritance feature of OWL. This means that properties referring to features of Tractatus concepts defined as classes, are inherited by their subclasses. But surely, even if a term is the superclass of another term, the subsumed term has not all the features of the superordinated term. This led to problems regarding e.g. classifying Tatsache, which on the one hand naturally belongs under Sachverhalt, but in other respects does not have all the properties of Sachverhalt. Here, a solution could be to use an anonym ancestor which only contains features that subclasses have in common. Then, different features can be attached to the subclasses. The same problem arose on a higher level, since Sachverhalt belongs to both superclasses Wirklichkeit and Bild, but should not inherit all their features. Baader, Franz, and Nutt, Werner 2003. Basic Description Logics, in: Franz Baader, Diego Calvanese, Deborah L. McGuinness, Daniele Nardi, and Peter F. Patel-Schneider (eds. ), The Description Logic Handbook. Cambridge: Cambridge University Press, 43-95. Brassard Gilles, and Bratley, Paul 1995. Fundamentals of Algorithmics. Prentice-Hall. Charniak, Eugene and McDermott, Drew 1985. Introduction to Artificial Intelligence, Addison-Wesley. Gruber, Thomas R. 1993. A translation approach to portable ontology specifications. Knowledge Acquisition, 5(2), 199–221. Nardi, Daniele, and Brachman, Ron J. 2003. An Introduction to Description Logics, in: Franz Baader, Diego Calvanese, Deborah L. McGuinness, Daniele Nardi and Peter F. Patel-Schneider (eds. ), The Description Logic Handbook. Cambridge: Cambridge University Press. 1-40. Pichler, Alois 1995. ”Transcriptions, Texts and Interpretation”, in: Kjell S. Johannessen and Tore NordenstamCulture and Value. Beiträge des 18. Internationalen Wittgenstein Symposiums. 13.-20. August 1995 Kirchberg am Wechsel, 690-695. Puppe, Frank, Stoyan, Herbert, and Studer, Rudi 2000. Chapter 15: Knowledge Engineering, in: Günther Görz, Claus-Rainer Rollinger and Josef Schneeberger (eds. ), Handbuch der Künstlichen Intelligenz. München: Oldenbourg Verlag, 599–641. Web Ontology Working Group 2004. Web Ontology Language (OWL). http://www.w3.org/2004/OWL/. Zöllner-Weber, Amélie 2006. Formale Repräsentation und Beschreibung von literarischen Figuren, in: Georg Braungart, Peter Gendolla, Peter and Fotis Jannidis (eds. ), Jahrbuch für Computerphilologie (7). Paderborn: mentis Verlag, 187-203. Zöllner-Weber, Amélie 2007. Noctua literaria - A System for a Formal Description of Literary Characters, in: Georg Rehm, Andreas Witt and Lothar Lemnitzer (eds.). Data Structures for Linguistic Resources and Applications. Tübingen: Gunter Narr Verlag, 113-121. Wittgenstein, Ludwig 1961: Tractatus logico-philosophicus. London: Routledge and Kegan Paul. This includes GOLD, an ontology for descriptive linguistic (http://www.linguistics-ontology.org/gold.html) and WordNet, a lexical reference system (http://wordnet.princeton.edu/). See the FRBR ontology for bibliographic records (Renear 2006). DISCOVERY - Digital Semantic Corpora for Virtual Research in Philosophy; see >http://www.discovery-project.eu/. OWL - Web Ontology Language; see http://www.w3.org/TR/owl-features/. Web Ontology Working Group 2004, see http://www.w3.org/TR/owl-features/. See Antoniou and Harmelen 2003. For creating the ontology, we have used Protégé ((see http://protege.stanford.edu/). Protégé is a general editor for ontologies, but includes plug-in support for the syntax of OWL and offers a graphical interface. In addition, more plug-ins have been developed for Protégé for support of logical reasoning. Other free available editors are SWOOP (http://code.google.com/p/swoop/) as well as SWeDE (http://owl-eclipse.projects.semwebcentral.org/). This has been observed on a more general level with regard to text encoding (see Pichler 1995). See Charniak and McDermott 1985, Brassard and Bratley 1995. A client-server based system to enable access to an ontology for literature studies is introduced by Zöllner-Weber 2007. We are aware of other possibilities for modelling semantics than ontologies, e.g. Topic Maps which focus on the relation between objects rather than on elaborated hierarchy. – Thanks to Deirdre Smith for improving our English. We would like to thank Stefano David for comments on an earlier version of this paper. Amélie Zöllner-Weber, Bielefeld, Germany and Alois Pichler, Bergen, Norway. Date: XML TEI markup by WAB (Rune J. Falch, Heinz W. Krüger, Alois Pichler, Deirdre C.P. Smith) 2011-13. Last change 18.12.2013.